My name is Gideon and I joined Balloon Ventures in the year 2014 when they started their entrepreneurship programs here in Kericho. I can say I am more than lucky to join Balloon Ventures because it was the turning point for my business and my life. When I joined Balloon Ventures, I was doing a clothes business but I changed to a fruit seller and since then I have been doing good in my business. I was introduced to Balloon Ventures by a friend who heard about the programme – an opportunity for entrepreneurs who were eager and ready to either start or grow their businesses. After a thorough interview from the Balloon ventures officials I was granted a chance to be one of the lucky entrepreneurs to join the program. My volunteers Anna and Chris were eager to meet me and they kept on giving me calls and sending me messages asking me when I will be available for the first two day class session before we venture into the market and experiment on my business idea and look into ways we can use to improve my business. What I learnt from Balloon Ventures I have done business for quite some time but I never knew how to do market analysis until I joined Balloon. Anna and Chris thought me how to keep my cash in and cash out records and do market analysis’s for my products. Since I joined Balloon I have been keeping my business records which have greatly helped me to know my break-even point for my business so as to make profit every month in my business. Another important thing I learnt from Balloon is to keep my customers as the first priority for my business and since then I have learnt to relate well with my customers and make them to be my regular clients. I never knew the importance of partners in a business but the moment I joined Balloon Ventures I learnt partnership is one of the activities that matter most in any business. 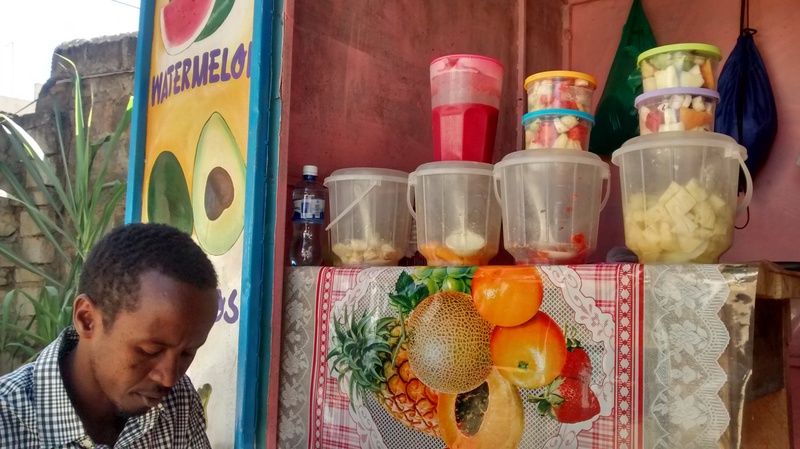 I have made partnerships with the nearest fast food kiosk which has turned to be one of the main selling points for the fruits that I supply. Message to any entrepreneur who wishes to join Balloon Ventures Don’t be discouraged by anybody, just follow your passion, Balloon Ventures is for real and it will make your hustle real. Commit your self, heart and mind to the program and at the end of the program you will have a reason to simile. Always work hard for the loan and remember to repay the loan on time for the sake of other entrepreneurs who are in need of those loans to either expand or venture into new businesses. Thanks to Balloon Kenya ventures for their good work. They trained youths in Kericho county in partnership with Kericho bunge Sacco. Me as an Accountant at youth bunge Sacco, I can witness that many beneficiaries have come to witness on their success. Thanks Balloon Kenya for the good job.